The research team Ludiciné from Université de Montréal (led by Bernard Perron) and the research center GameCODE/TAG form Concordia University (led by Bart Simon) will once again host some interdisciplinary academic shinny on a single game. As always, the symposium represents a game studies challenge to test our assumptions, methodologies and perspectives. This year, we’ll immerse ourselves in HEAVY RAIN (Quantic Dream, 2010). The Ludiciné Research Team from the Université de Montréal is pleased to invite you to the book launch of Horror Video Games: Essays on the Fusion of Fear and Play, edited by Bernard Perron, with a foreword by Clive Barker and essays from Bernard Perron, Martin Picard, Guillaume Roux-Girard and Carl Therrien, from 5 to 7 pm on the third floor of L'Amère à boire. 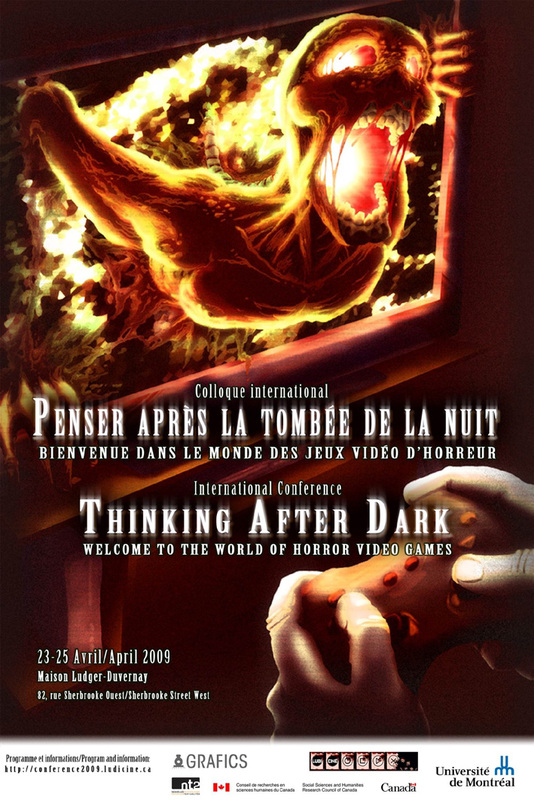 Bilingual (French/English) international conference on the study of horror video games organized by Ludiciné. Thursday, Friday and Saturday, April 23rd-25th, 2009. As fear is the oldest and strongest emotion of mankind (Lovecraft), human beings have always taken a malicious pleasure in frightening themselves. If literature and cinema were and still represent good means for the expression of horror, nowadays, the experience of fear is as intense in video games. While academia has been studying horrific literature and films for a few decades, such an interest for the videoludic side of horror has not, until now, showed up. Yet, since the cinematic staging of fear in Alone in the Dark in 1992, the Survival Horror has become a prolific genre offering a wide selection of significant games such as the Resident Evil, Silent Hill and Fatal Frame series. Because it is at the crossroads of diverse cultural heritages and the latest technological developments, and because it exhibits the ins and outs of the matrix that governs all but a few games (spatial navigation and survival), horror video games require a deeper study. This international conference wishes to study horror video games (not necessarily labeled survival horror) from an eclectic range of critical and theoretical perspectives. 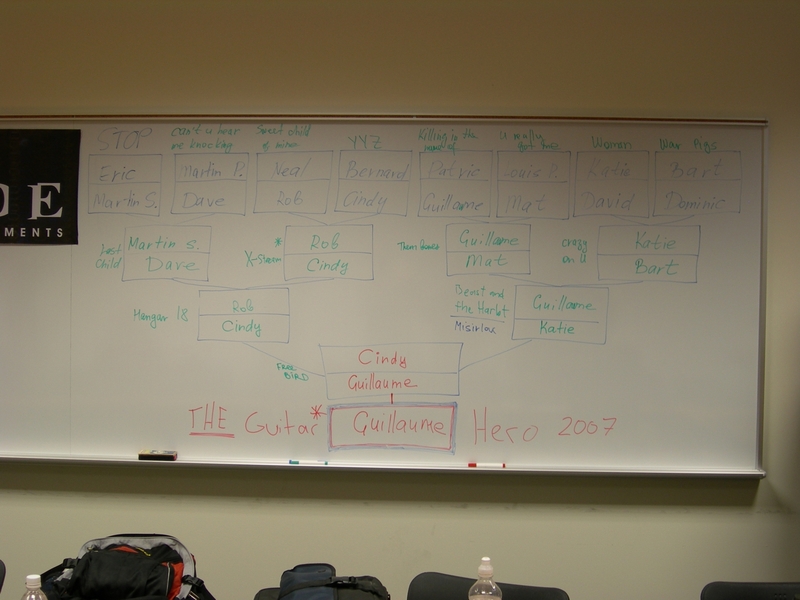 It aims to fill a gap in game studies between general theory and analysis of particular genres and games. As with previous years, Bernard Perron (Ludicine, UdeM) and Bart Simon (GameCODE/TAG, Concordia) will host some interdisciplinary academic shinny on a game few of us have played, none of us has studied, and on which no one – except the keynote speaker – is exactly sure what to say. As always, the symposium represents a game studies challenge to test our assumptions, methodologies and perspectives against one another on a virtual ice as only Canadians can. A video game studies symposium from Ludiciné, the HomoLudens research group on communication and socialization in video games (Université du Québec à Montréal), and the CRITIC team (Institut Télécom, Paris), as part of the 76th annual conference of the ACFAS (Association francophone pour le savoir). Roundtable on interactivity with Gregory Chatonsky, Louis-Claude Paquin, Bernard Perron and Bertrand Gervais presented by NT2, the Laboratoire de recherches sur les ouvres hypermédiatiques, and Figura, the Centre de recherche sur le texte et l'imaginaire de l'UQAM. Film screening, discussion with the filmmakers and party with DJs.